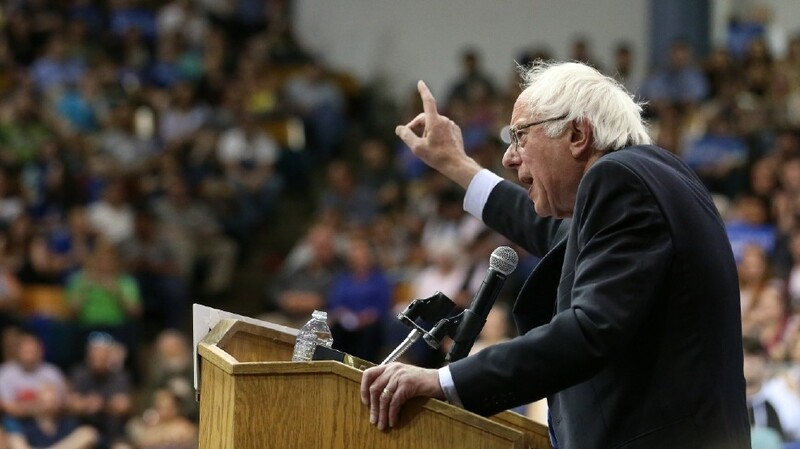 Democratic presidential candidate, Sen. Bernie Sanders, I-Vt., speaks during a campaign rally on Tuesday, May 10, 2016, in Salem, Ore.
LOUISVILLE, Ky. (AP) — Bernie Sanders has won his 19th state, only four short of Hillary Clinton’s tally, but that’s not the gap that counts. Despite his decisive victory in West Virginia on Tuesday, winning 51 percent of the vote to her 36 percent, Sanders trails nearly hopelessly in the contest for delegates needed to secure the Democratic presidential nomination. Clinton is in the mop-up phase now, 94 percent of the way to the magic number when the party insiders known as superdelegates are included, and on track to clinch the nomination in early June. Republican Donald Trump is closing in on his prize, too, 92 percent of the way there after wins in West Virginia and Nebraska on Tuesday — in a field with no rivals left. Sanders is vowing to fight on. He campaigned in Oregon and California on Tuesday and his victory in West Virginia highlighted anew Clinton’s struggles to win over white men and independents — weaknesses Trump wants to exploit in the fall campaign. Among those voting in the West Virginia Democratic primary, about a third said they would support Trump over either Clinton or Sanders in November. An additional 2 in 10 said they wouldn’t vote for either candidate. But 4 in 10 also said they consider themselves to be independents or Republicans, and not Democrats, according to exit polls. While Sanders is still attracting thousands to rallies, his campaign has grown more difficult as Clinton closes in on the nomination. His fundraising has fallen off and so, too, has his advertising, with only about $525,000 in ads planned for California and $63,000 each in West Virginia and Oregon, according to advertising tracker Kantar Media’s CMAG. That’s a significant decline from the wall-to-wall advertising campaign he ran earlier in the primary, during which his $74 million in ads outspent Clinton by $14 million. Edward Milam, of Cross Lanes, West Virginia, is a self-described socialist who gave money to the Sanders campaign but his vote Tuesday to Clinton. Even as the primaries continue, Clinton has largely shifted her focus to the general election.